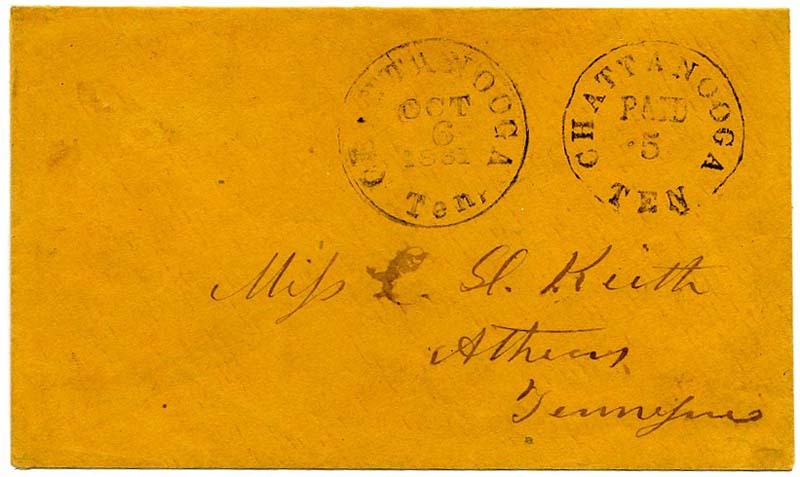 Chattanooga, Tenn., 5¢ black #17XU2, clearly struck provisional handstamp on clean cover to Miss L. H. Keith, Athens, Tennessee; neat Oct 6, 1861, matching town postmark, Very Fine, 1989 PF certificate. Said to be ONE OF ONLY SEVEN RECORDED EXAMPLES, SCV and CCV $2,500. $2,000. 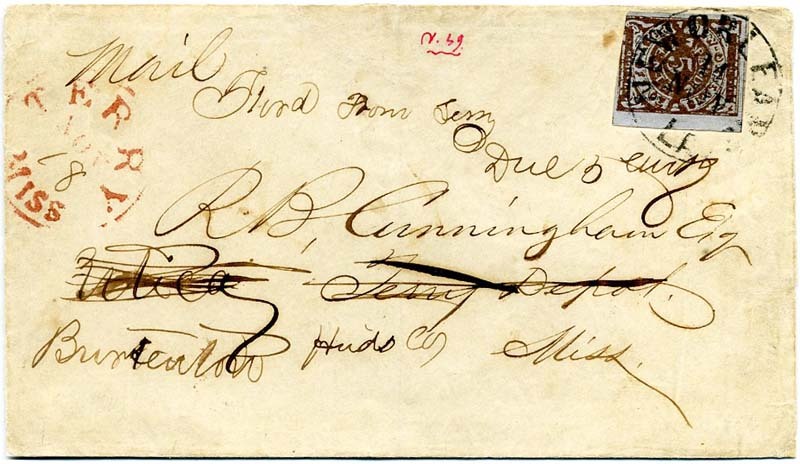 Nashville, Tenn., 5¢ carmine # 61X2, tied by bold blue Sep 11, 1861, Nashville postmark on cover to Thos. 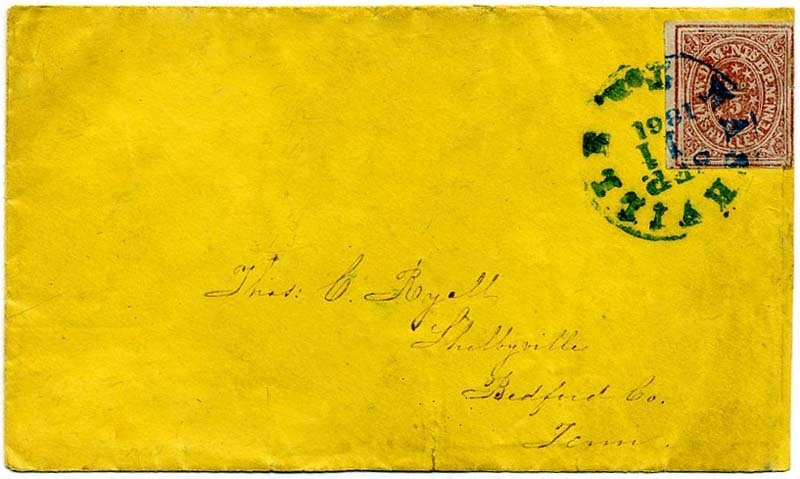 C. Ryall, Shelbyville, Tenn.; cover with small sealed tear at bottom and repair along right side; stamp with tiniest faults at right edge, Fine. SCV $3,500. $1,500. Thomas C. Ryall, Sr. (1809-18xx) was a prominent citizen of Bedford County, Tennessee. Much more information on linked page. Athens, Ga. 5¢ purple #5X1, Type II, large to huge margins, rich color, usual grid cancel with matching ATHENS / GA. // PAID / JAN / 2  cds on cover to J. J. Toon, Esq., Bell Buckle, Tenn; slightly reduced at top with tiny repaired flap and edge nicks, still Very Fine, ex Hall and Powell. J.J. Toon was a Confederate publisher working for the government of Atlanta. SCV $2,000. $1,800. Barnwell C.H. 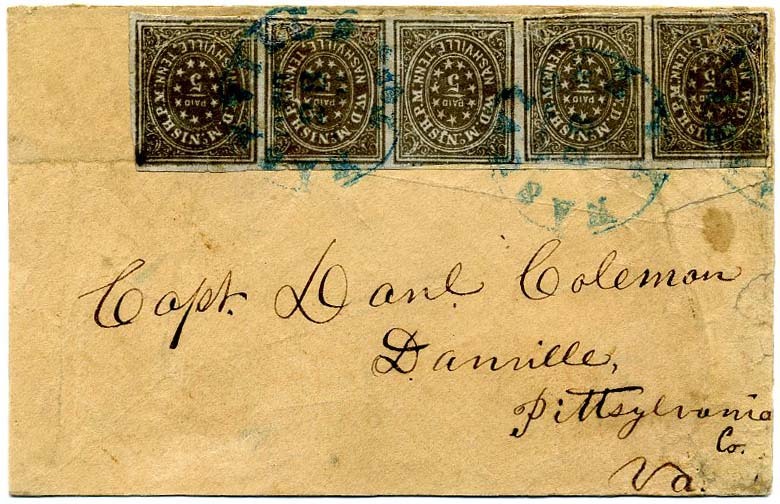 S.C. 5¢ black #123XU1 provisional entire with boxed PAID and manuscript Paid 5 at right, small restored piece at lower right which would benefit from a more expert touch, addressed to J. Stark Simms (sic), Grindal Shoals, Pocalet (sic) River SC. Crown survey lists only two but four are now recorded. SCV $3,000. $1,400. Major Joseph Stark Sims commanded the company known as the Pacolet Blues. Much more information on linked page. 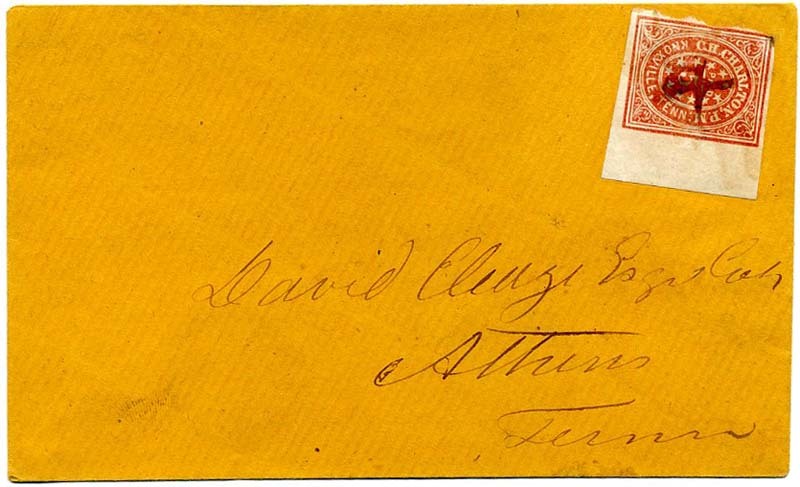 Knoxville, Tenn. 5¢ brick red on grayish laid paper #47X1 plated by prior owner as position 9, large right sheet margin copy canceled by manuscript "X" on pristine cover to David Cleage, Athens Tenn., Very Fine approximately 22 covers recorded with the this provisional, Ex Powell, SCV $2,100. $1,800. 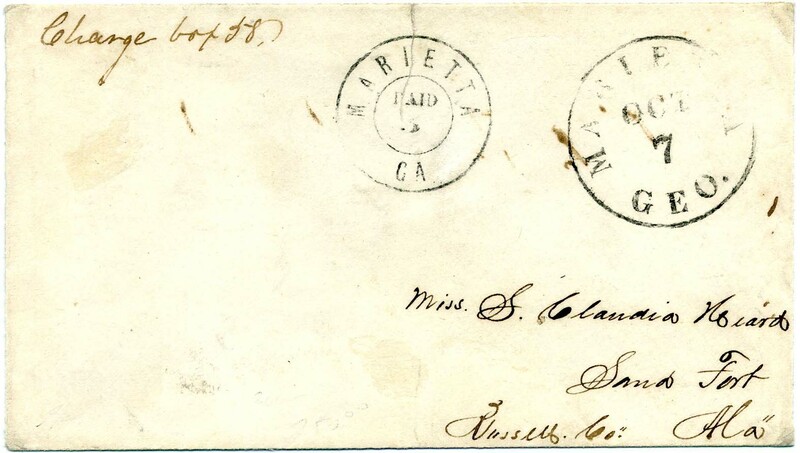 Mobile, Ala. 2¢ black #58X1, irregularly separated at top corners, tied MOBILE / ALA // OCT / 1 / 1861 double circle datestamp on legal cover addressed locally to Major Thos. A. Hamilton, Asst. Adjt. Genl. 9th Brigade A.M. (Alabama Militia), Mobile with directive “Militia Service” at lower left. Contents docketing along left end “Report of 9th Regt Recd. Oct 1, 1861.” Typical file folds well away from adhesive. Crown census only records 23 covers with the 2¢ Mobile provisional, Ex Matz. SCV $6,000. $1,500. Much more information on linked page. Nashville, Tenn. 5¢ carmine #61X2, plated by previous owner as position 1 with sheet margin at top, scissor cuts in left margin, tied by bold strike of blue PAID and matching NASHVILLE / Ten. // AUG / 25 / 1861 cds on cover to T. S. Sutterloh, Esq, Fayetteville, North Carolina; missing lower back flap, signed Dietz, Ex Agre and Powell. 1992 CSA certificate, SCV $3,500. $2,500. 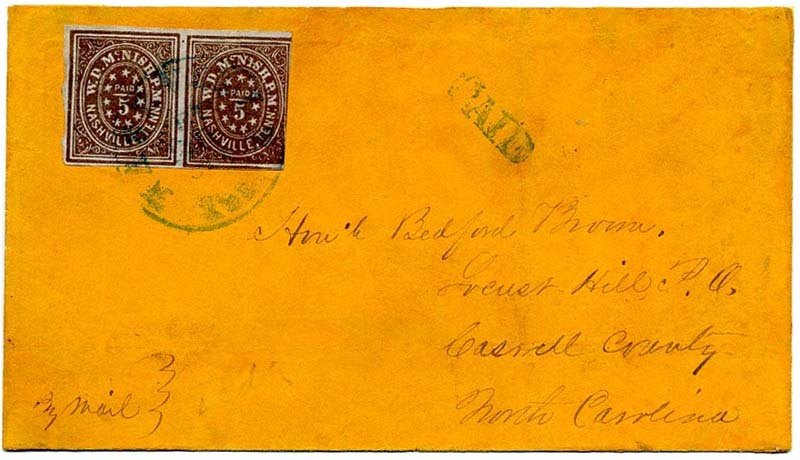 Nashville, Tenn. 5¢ brick red #61X1, plated by previous owner as position 3 from the top row, tied by blue Sep 10  town postmark with day slug inverted, on cover to Wm. E. Baird Esq, Cornersville, Tenn. Reduced a bit at right and cover repairs top right and center right. 2005 CSA Certificate 04628. SCV $3,500. $1,500. 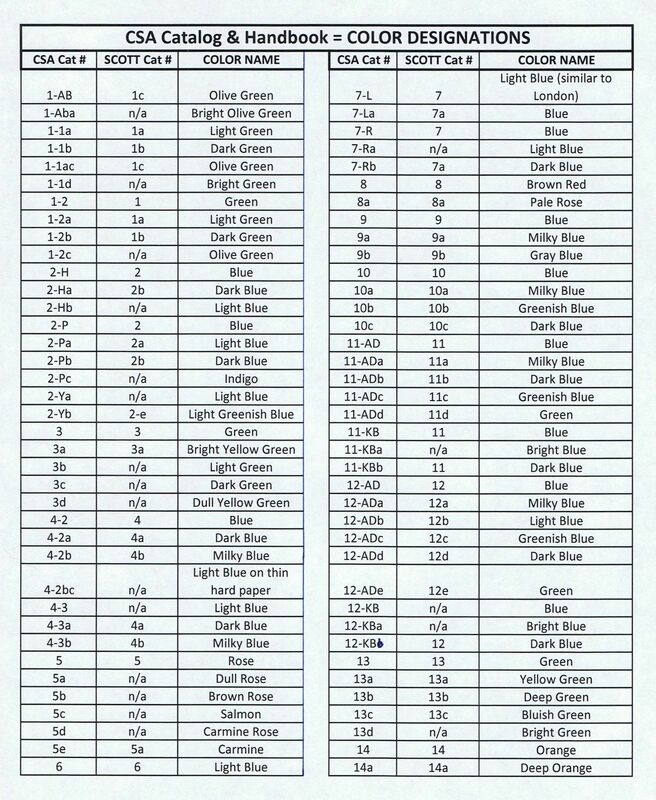 Per the 1860-61 Tennessee State Gazetteer and Business Directory, William E. Baird was a “Dealer in Dry Goods, Yankee Notions, Queensware, Hardware and Castings, Family Drugs, Boots, Shoes, Etc.” Per the 1855 List of Post Offices in the United States, he was also the postmaster for Cornersville. 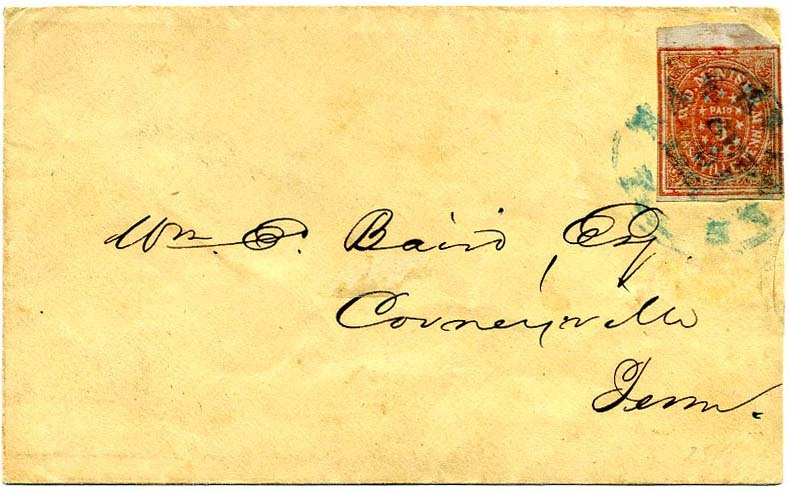 The 1861 edition does not show the name of the postmaster. Nashville, Tenn. 5¢ grayish brown (61X5 variety) horizontal strip of five, plated on verso as positions 3, 2, 1, 3, 2, dark intermediate shade between Violet Brown and Gray, tied by blue NASHVILLE / TEN. // OCT / 23/ 1861 cds on rebacked front only to Capt. Danl Coleman, Danville Va., strip lifted and repaired with parts of design drawn in. THE LARGEST RECORDED USED MULTIPLE OF ANY NASHVILLE PROVISIONAL. Ex Hobbs, Wiseman, Gallagher, Rudy and Powell. $4,500. Captain Daniel Coleman (1821-1905)was in the Spring Garden Blues, Eighteenth Virginia Regiment. Much more information on linked page. Nashville, Tenn. 5¢ violet brown (61X5) horizontal pair tied by usual blue town postmark with matching PAID straightline on cover to Honl Bedford Brown, Locust Hill, Caswell County, NC; cover with expert repairs, Ex Seybold and Powell. SCV $6,000. $2,300. Honorable Bedford Brown (1795-1870) was a US Congressman.When President Lincoln request troops from NC to serve in the Union Army, Brown, along with most of his colleagues, supported secession. Much more information on linked page. New Orleans, La. 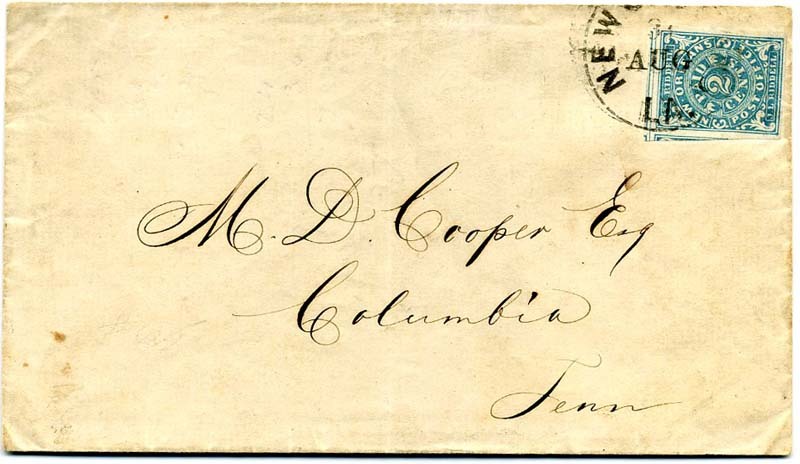 2¢ blue #62X1 with very large margins including part of adjoining stamps at top and left, tied by 31 Aug town postmark on cover to M. D. Cooper Esq, Columbia, Tenn, light vertical file fold well away from stamp. Very Fine. 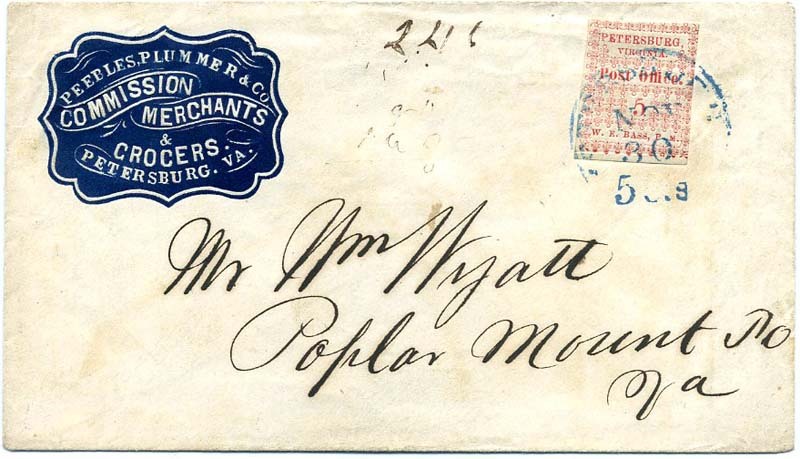 A choice four-margin example on a circular-rate cover, signed Dietz, Ex Powell. SCV $5,000. $4,500. Matthew Delamere Cooper of Columbia, Maury County, Tennessee was a wealthy planter and highly successful businessman with a large commission house in New Orleans. Much more information on linked page. New Orleans, La. 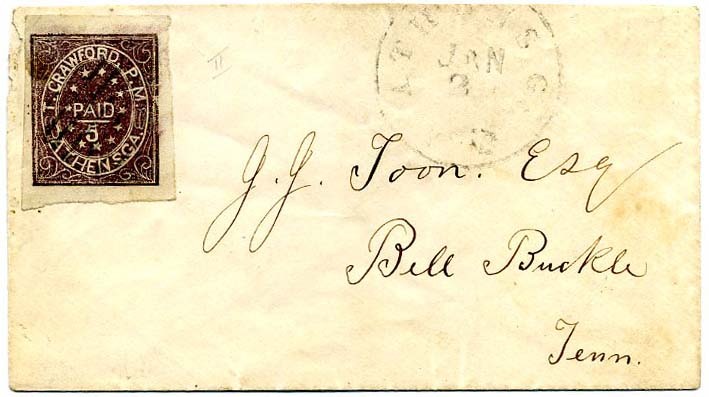 5¢ red brown on bluish #62X4 tied by 14 Nov town postmark on cover to R. B. Cunningham, Esq, Terry Depot, Miss. and FORWARDED TWICE, first to Utica, Miss. and then to Burtenton, Miss., red TERRY / MISS // NOV / 18 cds with day in manuscript, manuscript "Mail Ford from Terry Due 5" and signed, red notation at top may not be contemporary, opening flap tears, forwarded twice but only charged once for forwarding postage. Exceptional forwarded provisional use. Ex Powell. $550. 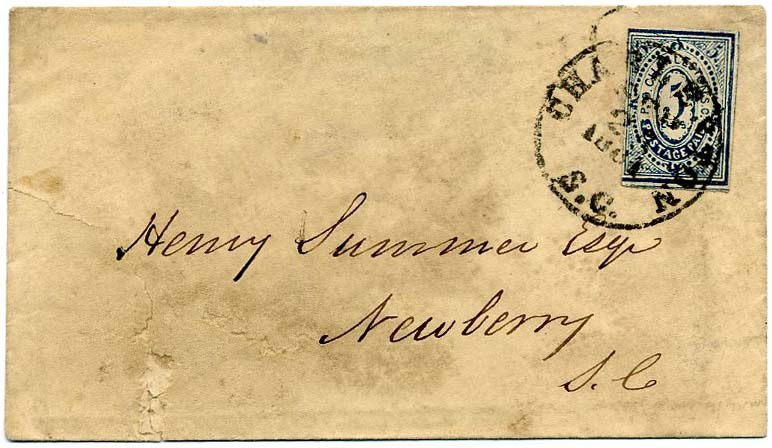 Charleston, S.C. 5¢ blue #16X1 tied neat Sept 25, 1861, cds on cover to Henry Summer. Esq, Newberry, S.C. Cover tear across bottom left corner ending in erosion at bottom. SCV $2,500. $950. Henry Summer was an attorney in Newberry, born into a family of slave-holding planters. Five generations of the Summer family papers (1753-1937) are available in the University of South Carolina. TULLAHOMA / Ten. 10¢ black #111XU1 handstamped provisional, the EARLIEST OF ONLY TWO RECORDED in the Crown Surveys. 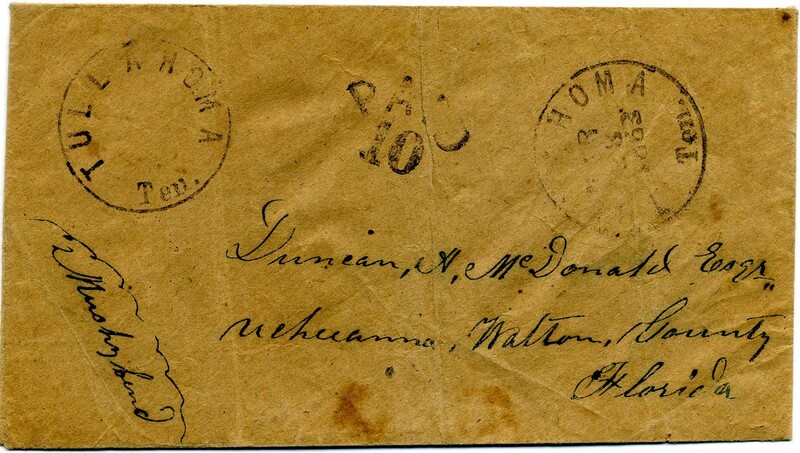 Addressed to Duncan A. McDonald, Esq. Eucheeanna, Mushy Bend, Walton County, Florida. Eucheeanna was the first Scottish settlement in territorial Florida, named in honor of the Euchee Indians. Light vertical file folds. Rare provisional. Ex Bogg and Haub. SCV $6,000. $4,500. 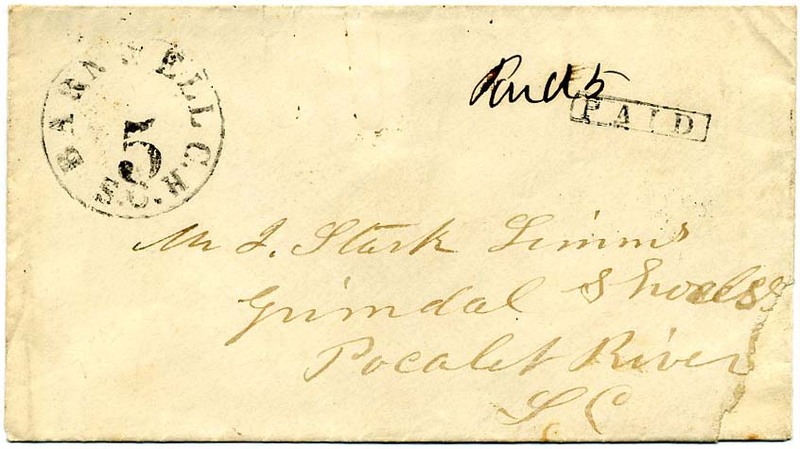 Atlanta, Ga., 1861, 5¢ black (6XU2, CV $1,000), well struck provisional handstamp addressed to Messr. 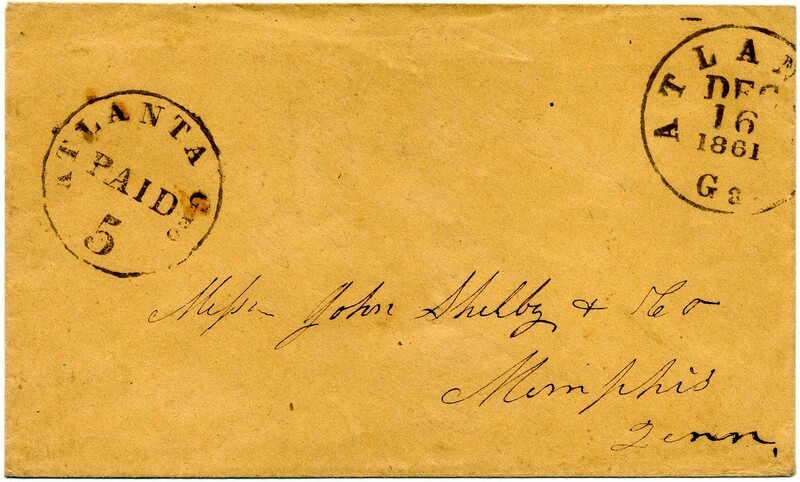 John Shelby & Co., Memphis, Tenn. ATLANTA / Ga. // DEC / 16 / 1861 cds at upper right, Very Fine. $600. 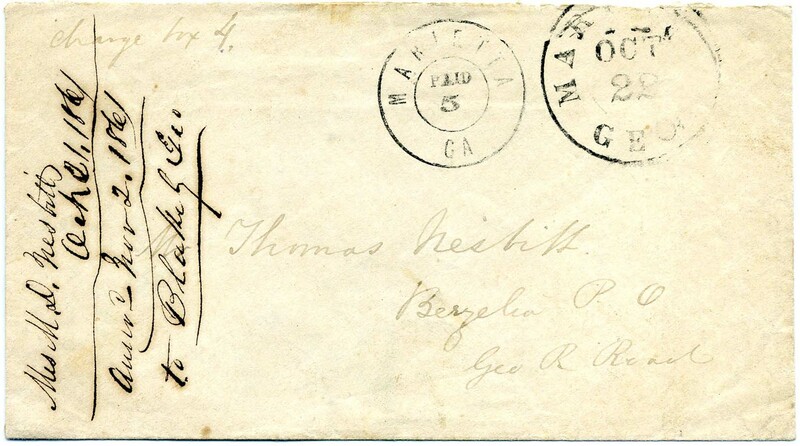 MARIETTA / GA 5¢ black provisional entire #53XU1 used with Marietta Oct 22  cds on cover to Thomas Nesbitt, Berzelia P.O. with contents docketing from Mrs. M.D. Nesbitt Oct 21, 1861. Interesting scheduling notes / names on back flaps in same hand. Plantation Collection, 2017 CSA certificate, SCV $500. CCV $750. $500. Dalton, Ga., 10¢ black #20XU2, clear strike of provisional handstamp, Jan. 10 [1862 cds on entire to Mrs. Mary Ann E. Harden, Athens, Georgia., Very Fine, ex Judd, 1987 and 2017 CSA certificates. SCV $1,250. $850. Mary Ann Elizabeth (Randolph) Harden (1794-1874) was the second wife of Edward Harden (1784-1849), planter and politician; a prominent slave-owning rice plantation owner. MARIETTA / Geo. 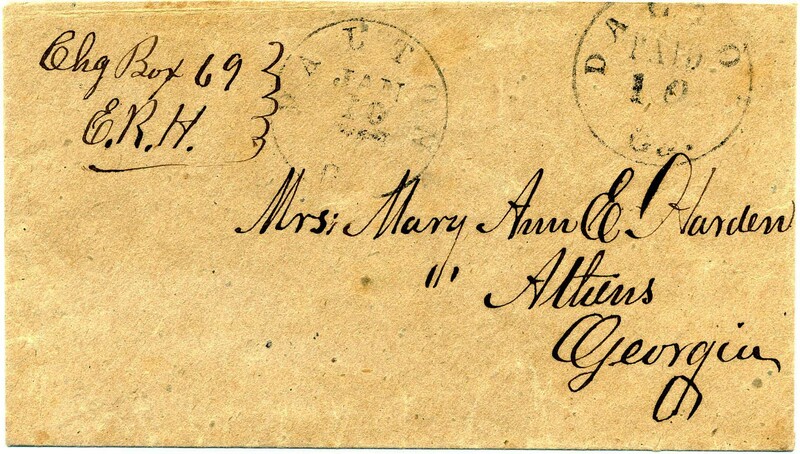 5¢ black (Scott 54X71 /CSA catalog MARGA-E02) used with Oct / 7 double circle postmark on handstamped provisional entire, addressed to Miss S. Claudia Heard, Sand Fort, Russell County, Alabama. Professionally sealed flap tears extending over top edge into rate marking. Very Fine appearance. 2017 CSA Certificate. CCV $750. $350. 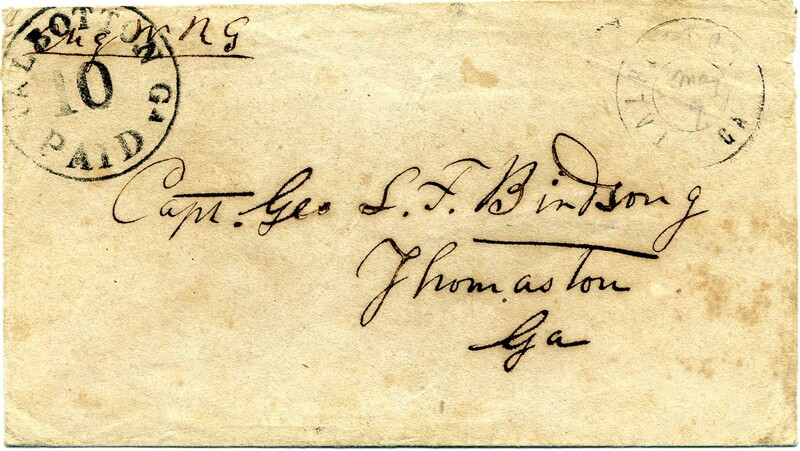 Talbotton, Ga., 10¢ black #94XU2, bold strike of provisional marking with Talbotton May 9 double-circle town postmark with date in manuscript on entire to Capt. Geo. L. F. Birdsong, Thomaston, Ga., minor foxing, 21 recorded in Crown surveys, 2017 CSA certificate, SCV $1,000. $500. George Lawrence Forsyth Birdsong served as a captain in Company C, 1st Georgia Battalion Reserve Cavalry as well as 12th Robinson’s Regiment Georgia Cavalry. Much more information on linked page. 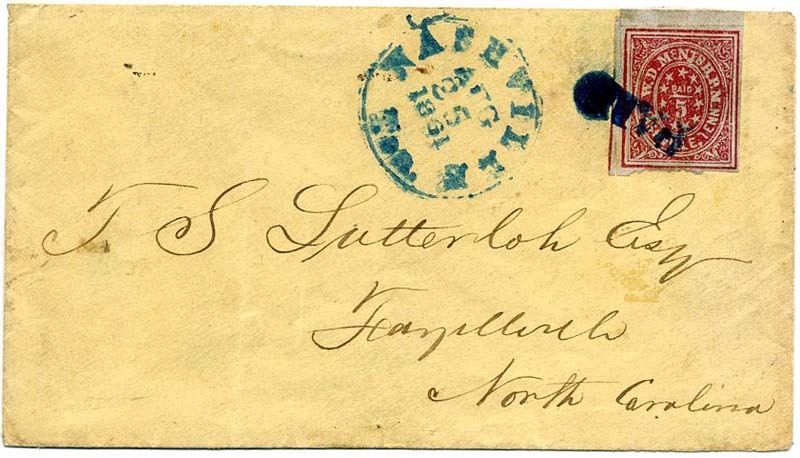 Fredericksburg, Va, 5¢ blue, CSA 26X1, (4 margin with upper sheet, plated as position 3) Minor faults including small sealed tear at left, tied by usual somewhat weak strike of town postmark. 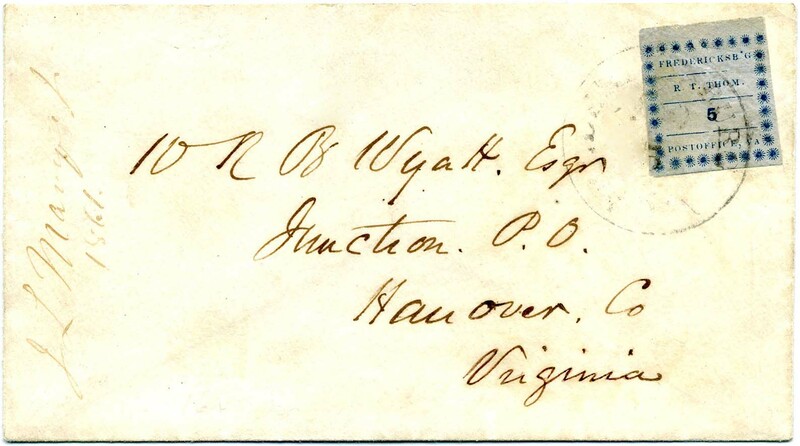 Addressed to W. R. B. Wyatt, Junction P.O., Hanover Co, Virginia. Listed on page 431 of the Crown Surveys (available for sale in the Literature section). Cover professionally and lightly cleaned to Very Fine appearance. Ex Caspary and Hill. SCV $5,500. $4,000. Jonesboro, Tenn., 5¢ dark blue provisional entire (Scott 45XU2) EARLIEST RECORDED USE / NEW DISCOVERY. Bears no postmark but is considered postally used, as noted in the CSA catalog. 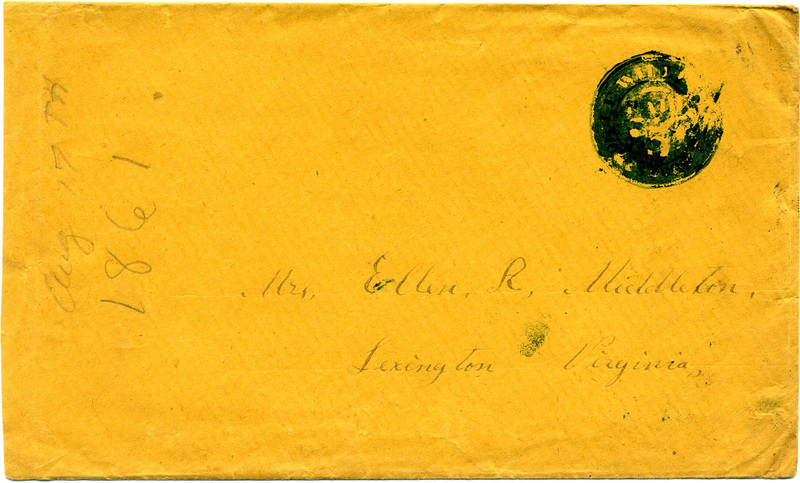 Addressed to Mrs. Ellen R. Middleton, Lexington, Virginia, with pencil docketing “Aug 17th, 1861.” Lot includes photocopy of original letter, which no longer accompanies, from John W. Middleton who was in Company H, 27th Virginia Infantry, On the organization of the Stonewall Brigade, it was assigned with nine other Companies to the 5th Virginia Infantry Regiment. Slightly reduced at left, impression somewhat muddy but unmistakable. Military records list Middleton’s residence as Jonesboro, E. Tenn.; others in the Middleton family lived in Lexington, Va. Much more information on linked page. Incredibly interesting backstory on this cover which appears in the March 2018 edition of the American Stamp Dealer and Collector. ONLY TEN JONESBORO 5¢ BLUE PROVISIONALS RECORDED IN CROWN, the prior earliest recorded was October 1861. SCV $5,000. $3,500.